Quality steeldrums made in Germany! For the past 40 years, E.C.S. steel drums stand for highest quality in the manufacturing of steel drums and steel harps (hand pans). Over the years, we managed to improve our manufacturing in Dortmund. Furthermore, we were able to enrich our range by innovations. Each instrument still is a real piece of handwork. It is our experience that turns it into what it has to be: an instrument made by enthusiasts for enthusiasts. 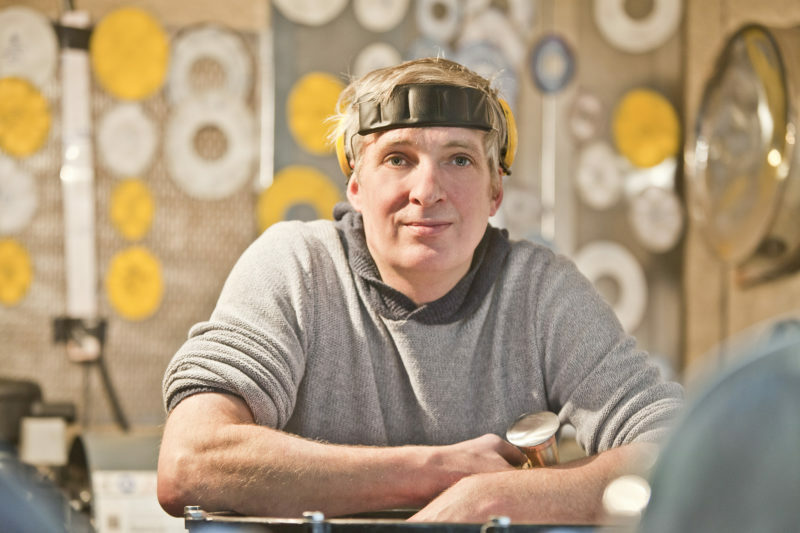 “Apart from two years of medical studies at the University of Essen, my life was marked by the confrontation with steel and metal. This is not surprising at all, because my city – the city of Dortmund – once was one of the most important steel production sites of Europe. I started my career in 1960 as an office machine mechanic. Later, I repaired offset printing machines. Later on, during my engagement with ThyssenKrupp and Hoesch, I became familiar with steel in its liquid phase as well as the procedure of refining of steel. 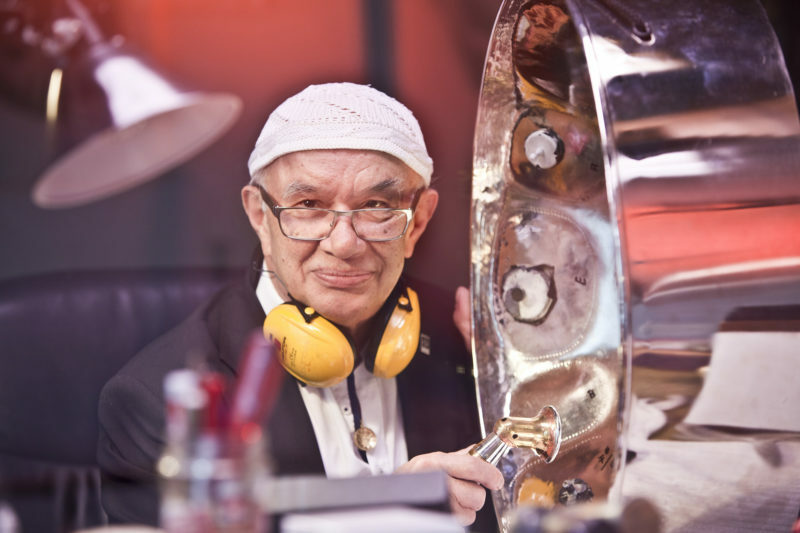 On January 4, 1978, I saw my first steel drum – it was love at first sight! The point is to teach the eye the vision, because the appearance of a steel pan is one of the most important conditions to achieve a beautiful sound. Meanwhile, I have created more than 20 different steel pan types. There are solo instruments like the BigMama or the Queen, a variety of pans for children like the pixipan or the teacher-pan-line, as well as the meditation-pan-line. With the integral layout, I have proposed – also to other tuners – an innovative structure of the tonal field. This will give the possibility to all pan players to operate levels 2 to 5 in a steel drum orchestra without any problems. My special love belongs to my soprano pan. Its sound has always been very different from all other melody pans that I have ever listened to until today. We will do even better! This is why I will remain with the metal. Over the years, production increased due to a growing demand. In 1998, Martin Speck joined E.C.S. Steeldrums in order to strengthen our staff. Meanwhile, after almost 20 years of experience, Martin Speck is a well-versed tuner of steel drums and steel harps. Today, in co-operation with Eckhard C. Schulz, Martin provides the consistent high quality of E.C.S. Steeldrums. 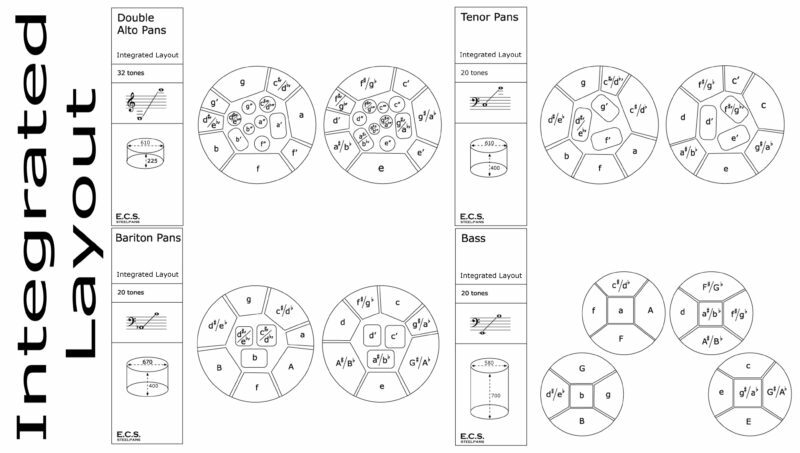 A milestone in the steelpan-development: The integral layout of E.C.S. Since the invention of steelpans in the 1940s in Trinidad & Tobago, almost nothing has happened regarding the development of layouts and the naming of the different pans. More than 15 years ago, we wanted to change this in order to achieve a significant improvement for all players and tuners. Through the years, we have participated in workshops at different places together with a great number of tuners, bandleaders, musicians etc. The topic of these symposia always was “The standardization of the steel plan”. This means that all tuners shall provide all types of instruments with the same layout. Apart from the fact that until today, there are still no concrete results from these symposia, this objective never was wide-ranging enough to us. Every member of a band should be able to play all pans in the shortest time possible. With the integral layout of the E.C.S. steel pans, this has been possible since 2002. We do see very clearly that the development of the pan in Europe – and probably everywhere in the world – can only advance by convincing well trained musicians as teachers for our concern. However, bearing in mind the unmitigated shambles of the different layouts, this seems to be practically out of the question. We are still interested in a lively discussion regarding this subject and we would like to recommend our idea to all the tuners for imitation. We are open to any questions with regard to this subject and are looking forward to an active exchange!